For broader coverage of this topic, see Earth's magnetic field. Owing to motion of fluid in the Earth's outer core, the actual magnetic poles are constantly moving. However, over thousands of years their direction averages to the Earth's rotation axis. On the order of once every half a million years, the poles reverse (north switches place with south). As a first-order approximation, the Earth's magnetic field can be modeled as a simple dipole (like a bar magnet), tilted about 9.6° with respect to the Earth's rotation axis (which defines the Geographic North and Geographic South Poles) and centered at the Earth's center. The North and South Geomagnetic Poles are the antipodal points where the axis of this theoretical dipole intersects the Earth's surface, thus unlike the magnetic poles they always have an equal degree of latitude and supplementary degrees of longitude respectively (2017: Lat. 80.5°N, 80.5°S; Long. 72.8°W, 107.2°E). If the Earth's magnetic field were a perfect dipole then the field lines would be vertical to the surface at the Geomagnetic Poles, and they would coincide with the North and South magnetic poles. However, the approximation is imperfect, and so the Magnetic and Geomagnetic Poles lie some distance apart. 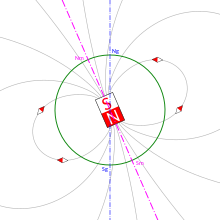 Like the North Magnetic Pole, the North Geomagnetic Pole attracts the north pole of a bar magnet and so is in a physical sense actually a magnetic south pole. It is the center of the 'open' magnetic field lines which connect to the interplanetary magnetic field and provide a direct route for the solar wind to reach the ionosphere. As of 2015[update] it was located at approximately 80°22′N 72°37′W﻿ / ﻿80.37°N 72.62°W﻿ / 80.37; -72.62﻿ (Geomagnetic North Pole 2015 est), on Ellesmere Island, Nunavut, Canada. The South Geomagnetic Pole is the point where the axis of this best-fitting tilted dipole intersects the Earth's surface in the southern hemisphere. As of 2005 it was calculated to be located at 79.74°S 108.22°E, near the Vostok Station. Because the Earth's actual magnetic field is not an exact dipole, the (calculated) North and South Geomagnetic Poles do not coincide with the North and South Magnetic Poles. If the Earth's magnetic fields were exactly dipolar, the north pole of a magnetic compass needle would point directly at the North Geomagnetic Pole. In practice it does not because the geomagnetic field that originates in the core has a more complex non-dipolar part, and magnetic anomalies in the Earth's crust also contribute to the local field. The locations of geomagnetic poles are calculated by the International Geomagnetic Reference Field, a statistical fit to measurements of the Earth's field by satellites and in geomagnetic observatories. The Geomagnetic Poles are wandering for the same reason the Magnetic Poles wander. The geomagnetic poles move over time because the geomagnetic field is produced by motion of the molten iron alloys in the Earth's outer core (see geodynamo). Over the past 150 years the poles have moved westward at a rate of 0.05° to 0.1° per year, with little net north or south motion. Over several thousand years, the average location of the geomagnetic poles coincides with the geographical poles. Paleomagnetists have long relied on the Geocentric axial dipole (GAD) hypothesis, which states that, aside from during geomagnetic reversals, the time-averaged position of the geomagnetic poles has always coincided with the geographic poles. There is considerable paleomagnetic evidence supporting this hypothesis. Over the life of the Earth, the orientation of Earth's magnetic field has reversed many times, with geomagnetic north becoming geomagnetic south and vice versa – an event known as a geomagnetic reversal. Evidence of geomagnetic reversals can be seen at mid-ocean ridges where tectonic plates move apart. As magma seeps out of the mantle and solidifies to become new ocean floor, the magnetic minerals in it are magnetized in the direction of the magnetic field. Thus, starting at the most recently formed ocean floor, one can read out the direction of the magnetic field in previous times as one moves farther away to older ocean floor. ^ a b c "Geomagnetism Frequently Asked Questions". National Geophysical Data Center. Retrieved 1 June 2016. ^ "Magnetic North, Geomagnetic and Magnetic Poles". World Data Center for Geomagnetism, Kyoto. Kyoto University. Retrieved 11 June 2018. ^ IAGA Division V Working Group V-MOD. "International Geomagnetic Reference Field". Retrieved 20 December 2016. This page was last edited on 30 November 2018, at 13:37 (UTC).